Trans Bay Steel Corp. is centrally located in Richmond California. This facility offers approximately 40,000 square feet of undercover fabricating space supporting fabrication and storage operations. We are positioned minutes from San Francisco and Highway 80, and are physically situated to serve a wider area of heavy steel plate fabrication and structural building projects in the San Francisco Bay Area, Sacramento-San Joaquin Delta and the greater Sacramento metropolitan area. Trans Bay Steel Corp. performs high quality steel fabricating to close tolerances as an AISC certified Shop. Providing heavy rolling, forming, machining, burning, welding, fabricated and structural products for the petroleum, marine, offshore, bridge and construction industries. 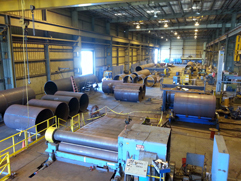 Large diameter thick walled (8”x10’A36, 4”x10’ HY-80) steel plate is formed on our rolls, medium carbon steel thru higher yield grades and alloys. All welding certified to AWS and AISC standards. 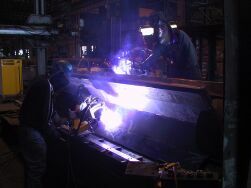 Fabricating steel beam and plate for all heavy industry applications.